or call me at 949-285-1189. Below are some samples of past classes. From 2013 to 2018, I have been moving a lot, writing my books and working on my art. It is 2019, and I am now living in Tempe, Arizona and I hope to start painting classes soon. 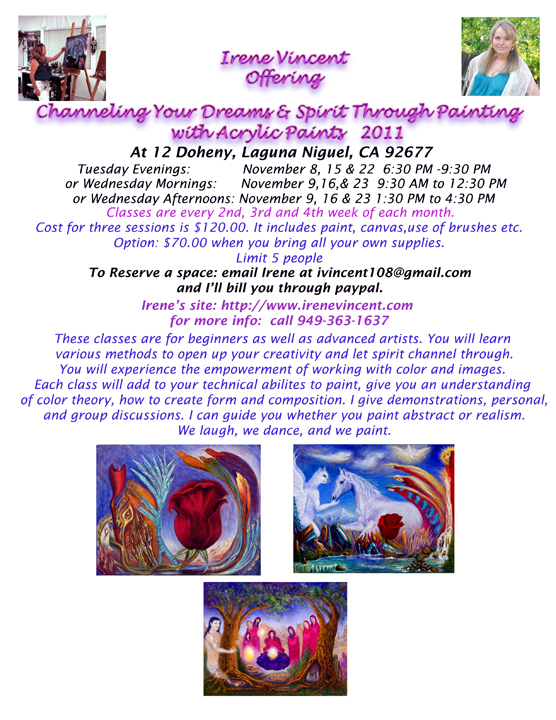 You are invited to: Irene's Expressionistic Art Show & Book Signing at Impact Health and Wellness Center Annual Christmas Party, Friday, Dec.13th,2014 from 6pm to 9pm. Come join us for this spiritual adventure: A Creative Writing and Art Retreat in Bali this February 11 to 23rd, 2014. It is for the novice as well as advanced writers, dreamers, and painters. It shall be fun and liberating. Channeling Your Dreams and Soul Through Painting with Acrylics. 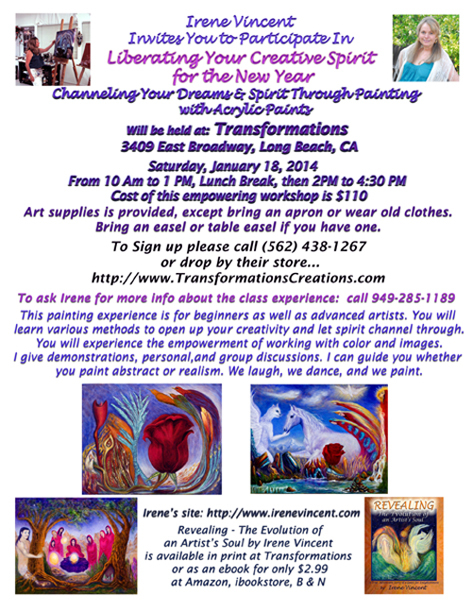 Experience the Healing Power of Transformation through Art. No artistic experience needed. 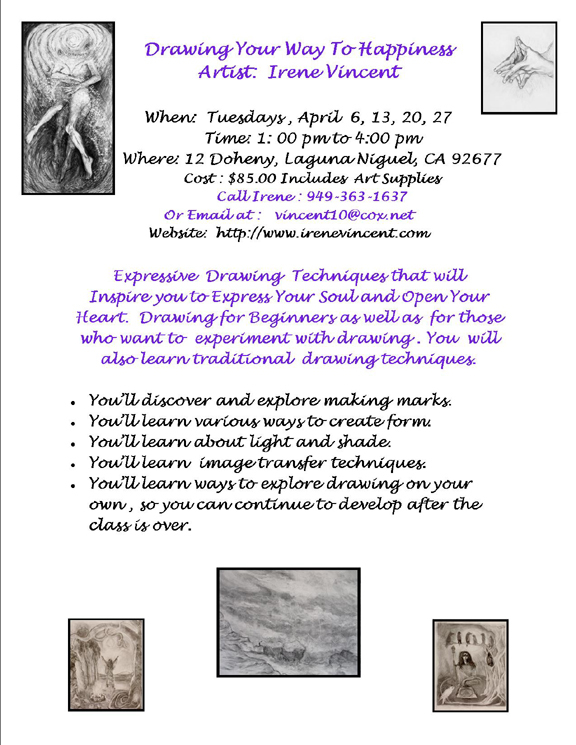 This class is for beginning artists as well as advanced artists. As Your Dreams and Visions Take Form on Canvas, Your Visual Journal is Another Way for You to Gain Self-Awareness and Access into Dream Time and Other Realities. Painting is a Wonderful Way to Bring Joy into Your Life this New Year. 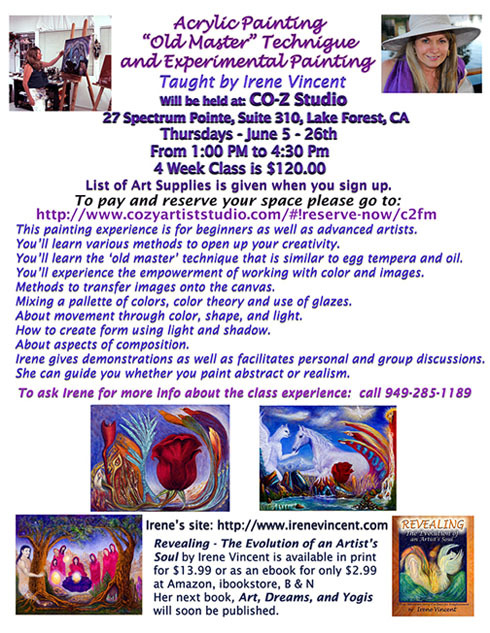 I will guide you in exploring color, composition, and various mediums. $40.00 per class with all supplies included. Cost is $25.00 each class if they bring required supplies. Painting with Oils and Egg Tempera over Oils. : Beginners to Advanced artists. I'll supply the mediums, & egg tempera for the class and two gesso boards. 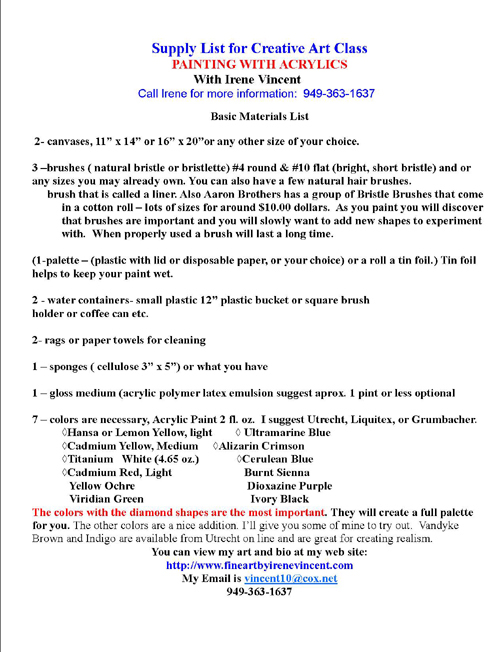 You bring your oil paint colors plus indigo color and your brushes, three small jars, & turpentine for brush cleaning. You can bring your your own gesso board also. You will learn to use egg tempera over the the final layers as high lights. You'll learn to mix the formulas. You'll learn how to create the egg tempera with a whole egg. Learn to create form with egg tempera. Learning how to transfer drawings to the canvas. Also you can paint with oils over Acrylics. Bring a drawing, a photograph, or portrait that you might want to paint. Or you can start the image free form like we do in our "Painting Your Way To Happiness Classes. " Cost is $200.00 Limited to five artists.